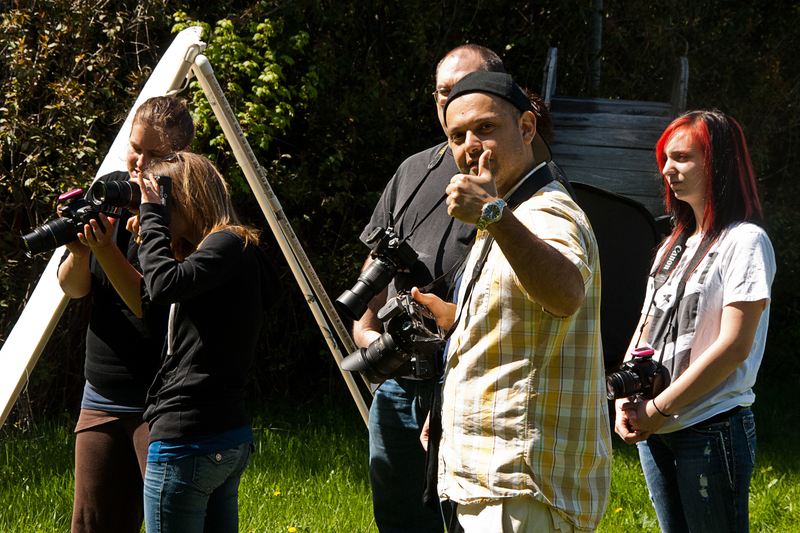 One more outdoor lighting workshop. I wish I had read that interview with Mr. Hobby before I began my series of workshops on off-camera flash. I would have started every class with his quote. With that, I thought I would let readers know about the last day of what became an enjoyable and successful day for everyone, the photographers, our model Danya, and me. Unlike the last session’s stormy overcast weather, the day this time was warm, sunny, and we didn’t have to contend with a cold, constant breeze. However, I couldn’t have asked for two better learning environments. An overcast day demands different lighting techniques than those that accompany a bright, cloudless day, and all I had to do was present the participants with opportunities specific to each so they could begin experimenting, and learning how to effectively use off-camera flash. 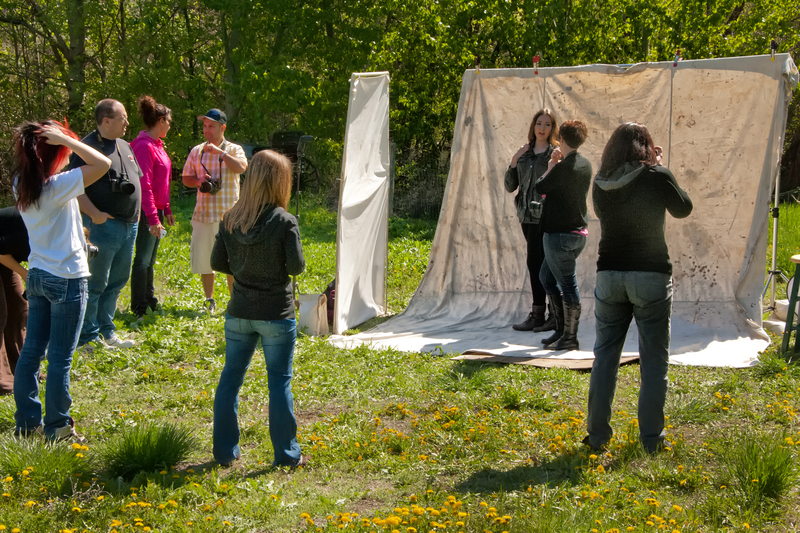 In the first session I introduced the ten participating photographers to basic outdoor portrait photography, and off-camera flash techniques that would help them transform their outdoor portraits into something special. This time I continued by putting together different lighting setups. 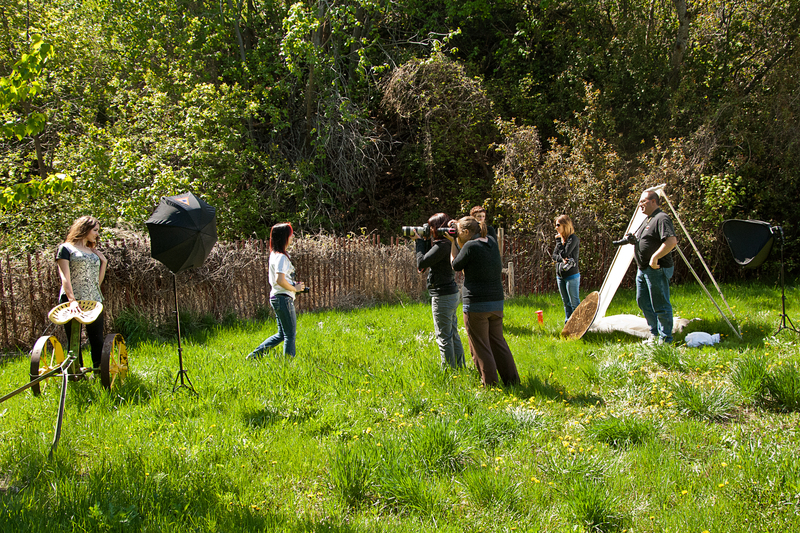 In the meadow, I erected a backdrop, and placed a 4×6 foot light diffusion panel with a wireless flash to one side. 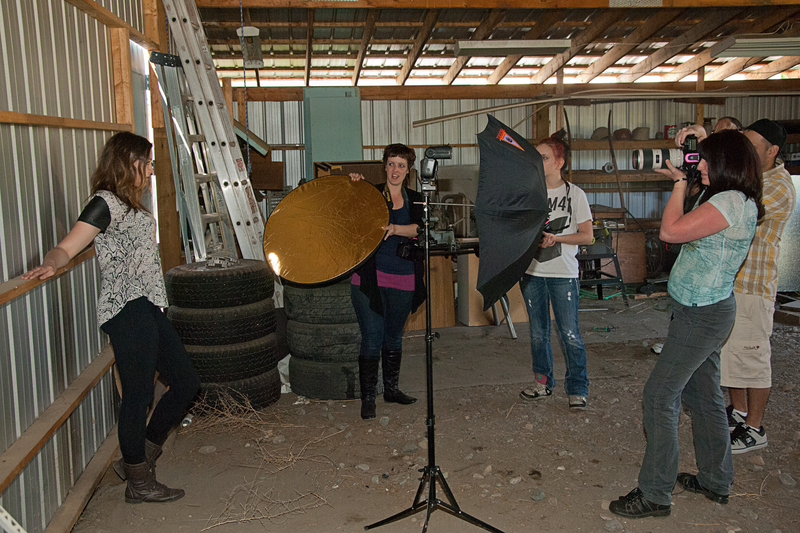 The second set up was a lean-to that used a 4×6 light diffusion panel. For the third set up, I placed in the barn a softbox and a bare flash on stands. 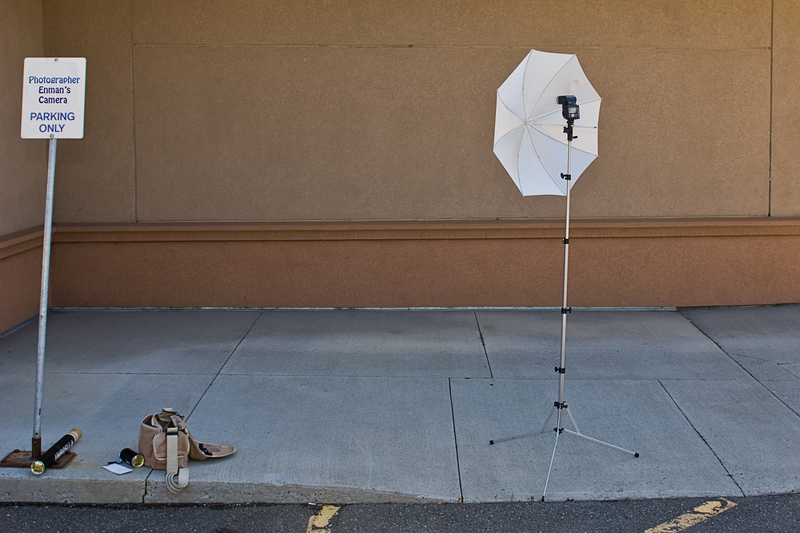 I also left extra wireless flashes on stands and a few reflectors outside the studio, ready for photographers to use when they wanted to select their own location. My goal was to give participants plenty of options as they put into practice what they had learned about adding flash to natural light. We positioned the 10×12 foot backdrop, made out of an old painter’s drop cloth, so it blocked the sun and swathed our model in diffused light, and then fired a flash through a diffusion panel placed on the left. The lean-to was constructed with a diffusion panel on one side. It softened the sunlight, giving a subject a diffused glow that could easily be manipulated with a reflector or flash. 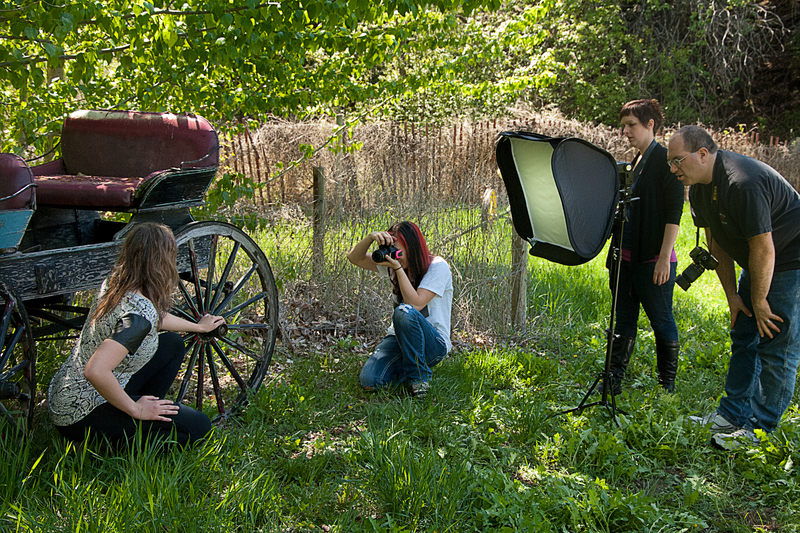 The softbox was perfect for the open shade in the barn. 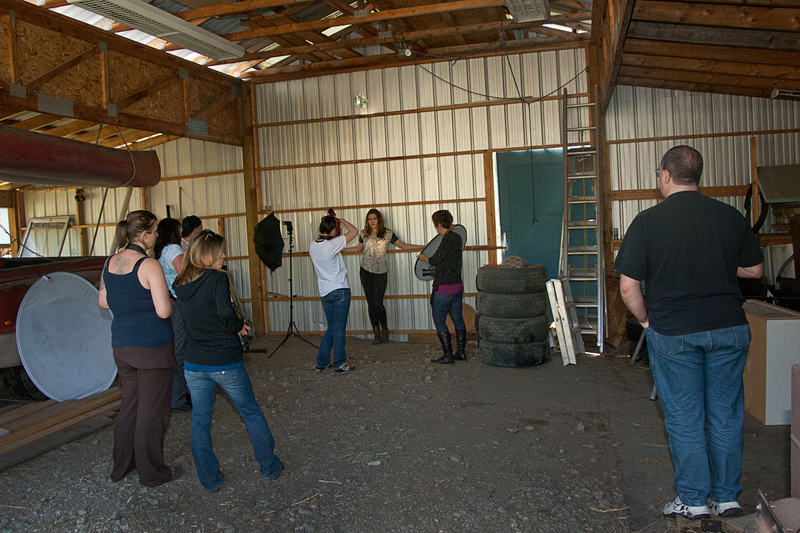 The large metal-sided barn gave lots of room and an interesting patterned backdrop. In that location the softbox, a flash and umbrella, and a reflector were used. I always use a flash when I am photographing people, inside or out. I can’t control the lights in a large room, or the sun shining on my subject from 93 million miles away. Participants discovered how to control the light they added from small off-camera flashes in the natural ambient light, and by the end of the workshop were using flash effectively, and learning about creating and controlling shadows rather than just filling them. We live in a time when cameras can almost see in the dark, and the art of adding light to a scene is under-appreciated. Those photographers ready and willing to turn down that ISO dial and learn about off-camera flash are beginning a journey of discovery that will remind them that photography is all about light. And I expect they might finally ask themselves, why not try to have the most perfect light possible…and instead of waiting for that perfect light, learn to control that light by adding flash to make the best of the situation. I have always been excited about technology changes in photography; for example, I remember how spectacular it was to have a workable, in-camera light meter when I got my Pentax Spotmatic II. Shortly thereafter I added a Vivitar 283 flash that allowed me to do preflash tests with my flash off camera and make adjustments to the lighting. Within a couple years came the wonderful Nikon F3 with TTL (through the lens) on-camera, flash metering, and for me the world of photography changed even more. Since then a lot has happened to flash photography and I will confirm that the current trend of using off camera, wireless hotshoe camera flashes is exciting. A greater number of serious photographers are learning to employ flash, from what was originally a flat, one-light source for an image, and they are starting to use the word “modelling” to show how the light affects their subject, and easily can wirelessly locate several small flashes at different positions around their subject. I recently talked to a friend learned about portrait lighting by attending a Scott Kelby lighting workshop, however, there are other very well known photographer-writers worth researching, people such as David Hobby (www.strobist.com) and Joe McNally (www.joemcnally.com) that have created a world wide following with their books, blogs, and videos on using wireless hotshoe flashes instead of the heavy, cumbersome, power cord lighting that photographers have previously used for many years (like me). So why go to wireless flash? Or, why a wireless hotshoe flash that we originally purchased to set on our camera? For me it comes down to ease of use and portability as I regularly do staff portraits for businesses. In the past I’ve arrived on site with two large bags of lighting equipment containing big strobe heads, stands, umbrellas and lots of power cords. Now, I carry lightweight stands and umbrellas in a small bag slung over my shoulder, and several small hotshoe flash units in a handbag. Both the equipment and the setup time is considerably less. As I have written before, I like using flash indoors or out. There are those times when I am following a moving subject and have my flash mounted above my camera on a flash bracket. I rarely rely on a single ambient light source and prefer using a flash to add light to improve the quality of my photographs. For occasions when my subject is stationary I use the wireless flash off camera; and for portraits I like three lights, one above and behind me, one off to the side and one behind the subject. My set up isn’t always the same, it depends on the available space, but for example, the flash above and behind might be either in a softbox or a reflector umbrella, the sidelight could be a small shoot-through umbrella or bounced off a reflector panel, and backlight directed at the background with only a small dome diffuser covering it. That’s one quick, effortless setup that I can easily carry in two small bags – one bag for light stands and one for the flash units while my camera is comfortably hung around my neck as usual. All this, as I just wrote, is easy to setup without having to connect the flash to the camera with wires and the flash to the wall with power cords. Because of the interest and questions fellow local photographer Rick Tolhurst (www.shotsbyrick.com) and I have been getting questions about how to setup and use small, off-camera, wireless flashes for portraits, we have decided to put on a simple lighting workshop. 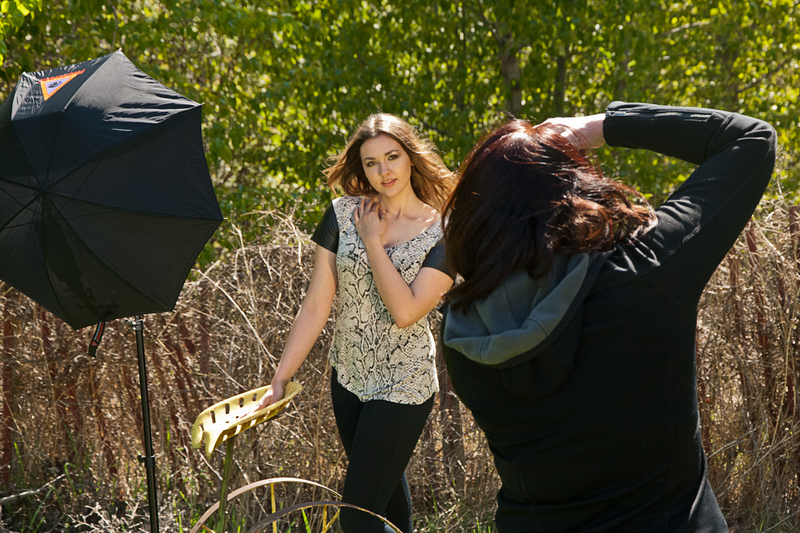 The interactive one-day session will discuss one, two, and three-light setups for portrait and glamour photography. For those interested the workshop will be held on Sunday, 30 October, 10am-4pm, cost is $60. Pre-registration is required and any photographers interested should call or email me for specifics. Using small wireless hotshoe flash has made photographing people a lot easier and serious photographers that have not tried it yet are going to feel the same way as those that dragged their feet in moving from film to digital.